Despite the unpredictable second half of Survivor: Caramoan, a sense of inevitability dominates the finale. Cochran has avoided the vote throughout the game, and his victory feels secure after he wins the final immunity challenge. The only question is whether Dawn or Sherri will receive any votes, and the bitter jury makes it clear neither has much chance to crack the scoreboard. While Jeff Probst makes a huge deal about Cochran being unconventional, it’s not a surprise to see him win the million. Along with playing a strategic game, he has the likability factor that’s eluded powerful contestants like Russell Hantz at their Final Tribal Council. The jury needs to feel good about giving the million dollars to the winner, and only one possibility fits that requirement. Dawn received unfair nastiness from fans after Brenda’s exit, but that move’s role in her game isn’t in question. That move confirms the jurors’ beliefs about her cold play and makes her emotional outbursts look phony. Dawn clearly was not playing a character, but the contradictions are too significant. Instead of providing an underdog story of how she overcame adversity to reach the end, Dawn becomes a symbol of victory at any costs. Cochran voted out almost everyone on the jury, but it was always about the game. Whether it’s fair or not, the jurors decide to reward a likable guy who makes no qualms about his focus on strategy. The Final Tribal Council includes several uncomfortable moments where the nastiness towards Dawn crosses the line. The worst is Brenda bullying her to remove her false teeth and humiliate herself. While her anger is understandable, this move is overly mean and accomplishes little more than making Brenda feel better. Cochran and Dawn worked as a pair since the start of the game, but his moves are applauded. Part of the issue is their personas from the South Pacific. Dawn was the mother of six who was too nice. Cochran was the Survivor nerd who was too nervous to play a successful game. Both returned this time with plans to change their perceptions, and neither leaves with the same impression. The elephant in the room is sexism, which allows some players to get away with moves while others suffer the consequences. It’s an intriguing subject that crosses gender lines, so it’s too simple to say that women are never considered great strategists. Parvati and Kim Spradlin both received credit for running the game and winning the top prize. On the other hand, Sophie and Denise were considered lesser-tier winners despite playing excellent games. There’s definitely a certain view among many fans of what makes a great player, and some will not live up to those expectations. Sherri also reaches the end yet gets no consideration from most jury members. Erik tries to summarize their lack of interest, but he comes off like a jerk piling on after the situation is clear. Her journey began with strong play to build an alliance and take out the two couples. After the merge, she adapted and joined the favorites. In a strange way, the closest model to her game is Phillip on Redemption Island. She clung to Dawn and Cochran and avoided risks to ensure her spot at the end. While the jurors are mad at Dawn, they respect her game a lot more than the third wheel. Sherri seems like a nice person, but the editing rarely shows her bonding with anyone. She skipped opportunities to shake up the game, and that safe play is not enough to earn respect. Speaking of Erik, he makes a very brief cameo in the finale and is medically evacuated minutes after the previous Tribal Council. His exit was clearly set up last week and creates less tension for the next two hours. The main question is whether Eddie will get a chance to “bro down” in the finals. He reveals smarts in giving his assessment of Erik because of his EMT job at home. It would have been interesting to see if Eddie could have made the right points to challenge Cochran’s dominance with the jury. Erik’s surprise exit forces the producers to shift gears. The winner of the “house of cards” battle receives an advantage in the final immunity challenge. This is unfortunate since it skews that key contest in favor of one player. While the edge did not benefit Malcolm in the Philippines, it helps Cochran this time. He struggles with the puzzle yet has a big enough lead to find the solution. The only chance for Dawn and Sherri leaves when Cochran wins that challenge. He makes the right choice and eliminates his last opponent towards victory. It doesn’t hurt that he also performs strongly with the jury and uses his trademark self-deprecating wit. When Malcolm asks about the differences between them, he brilliantly calls out his own uncertainty. Cochran throws Dawn under the bus without being overly nasty, and he even humors Eddie’s goofball question about hanging out at the bar. In other news, Reynold comes off like a jerk and ruins some goodwill by bashing Dawn, and Philip revokes Sherri’s membership in Stealth ‘r’ Us. How will she live? 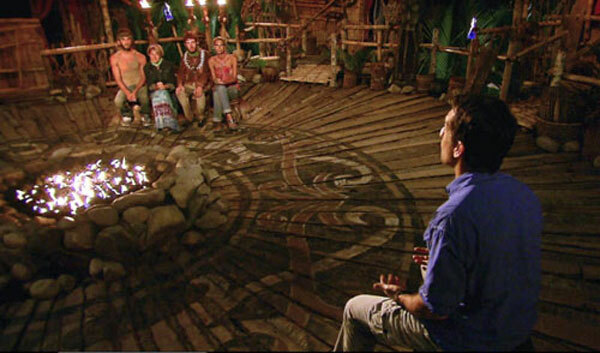 Despite the hate, it’s an interesting Final Tribal Council and shows why Cochran deserves to grab the ultimate prize. The reunion is marred by the decision to move the non-jury members off the stage. 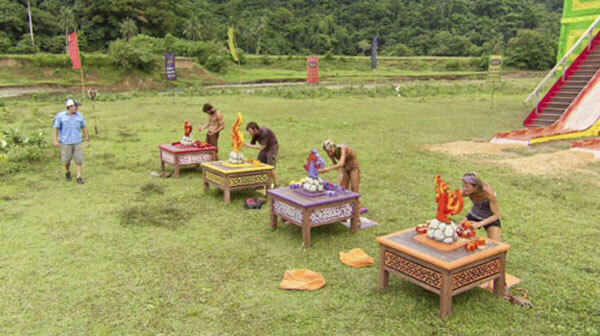 It’s possible this move tries to disguise the absence of Brandon Hantz, who was banned from attending the live show. Either way, it creates a strange feeling all is not right in the Survivor world. Jeff spends too much time talking to Rudy and Boston Rob instead of the current players. It’s hard enough to find time to speak to everyone, so why waste time on distractions? The Boston Rob chat is obviously designed to plug his new book. That is not a good way to use the limited minutes. Jeff also seems to think Cochran’s win is a lot more surprising than it really is. There are past examples of slim guys taking the top prize. Todd Herzog and Bob Crowley were hardly alpha males. Cochran modeled his game after Rob Cesternino and caught the right breaks to finish the deal. Despite the issues with the reunion and some poor casting moves, there still was plenty to like during this messy season. The twists for the next installment may be an entirely different matter. Regardless, it’s remarkable to find a show still providing great entertainment in its 26th outing. Cochran won... oh, that's good. I liked that guy. No more Hantz in the show... ever. That and don't bring back that Colton kid either. It's going to take something big to get me watching this show again. I think we're safe with Brandon Hantz, but I wouldn't be shocked to see Russell return at some point. He gets them ratings and makes people talk, even if he's so full of himself. As far as Colton, I'll just say that you probably won't want to watch next fall.